Vorbemerkung: Dieser Blogpost wurde auf Englisch verfasst und nicht übersetzt. Weil wir unseren LeserInnen genügend Sprachkompetenz zutrauen, weil Communities Sprachgrenzen überwinden – und weil das IAM grenzübergreifend forscht und denkt. 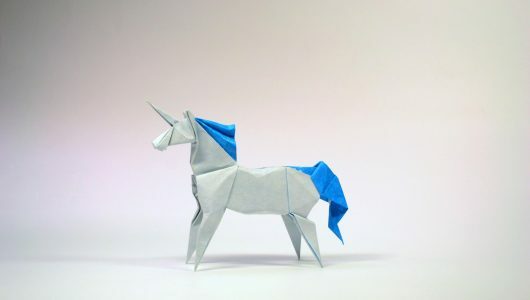 Virtual Communities are like unicorns: too mystical to be real. Sometimes, if we get very lucky, we might find one. That doesn’t happen very often. If you meet one, be prepared for sparkle, fairy dust, and magic moments – or, in other words: true engagement, authenticity, and unexpected outcomes. Organisations invest a lot brainpower and money into building and managing communities. Possible goals are: higher customer retention, increase in feedback and ideas from customers, or establishment of credibility. The underlying consideration is: If customers interact with one another and questions get answered by community members, organisations gain valuable information about customers’ preferences and opinions, and sometimes even product innovation. This can lead to cheaper costs in support but also to up-selling, or new contacts. Another goal is that community members freely talk about us as an organisation. If they are happy with what we do, they share their praise with the rest of the community and beyond. Which is great for our reputation! There are some famous success stories proving all these expectations true, like the Lego Case Study, which by the way is also a perfect example of how visibility and engagement in organisational communication can impact public discourse – although not always in an intended way. But most organisations are still communicating with audiences on social media, which are far from being communities in the real meaning of the term. Howard Rheingold, an influential writer and thinker on social media, differentiates between virtual communities and online social networks. He defines a virtual community as a “[…] network of interpersonal ties that provide sociability, support, information, a sense of belonging and social identity. […] The difference between an online social network and a community has to do with the quality, continuity, and degree of commitment in the relationship between members.” Social identity and a sense of belonging don’t emerge out of the blue. What are the secrets behind Virtual Communities worthy of the name? Being an online ethnographer, I have been observing several virtual communities for a while, trying to figure out regularities while systemising the success criteria. My absolute favorite is the YOU-Community. The goal of the YOU-Community is simple and quite ambitious: „Billions of healthy people“. The path leading there is paved with science-based micro actions for a sustainable behaviour change and for personal development. 100,000 people from all over the world use the YOU-App daily to improve their physical and mental wellbeing. 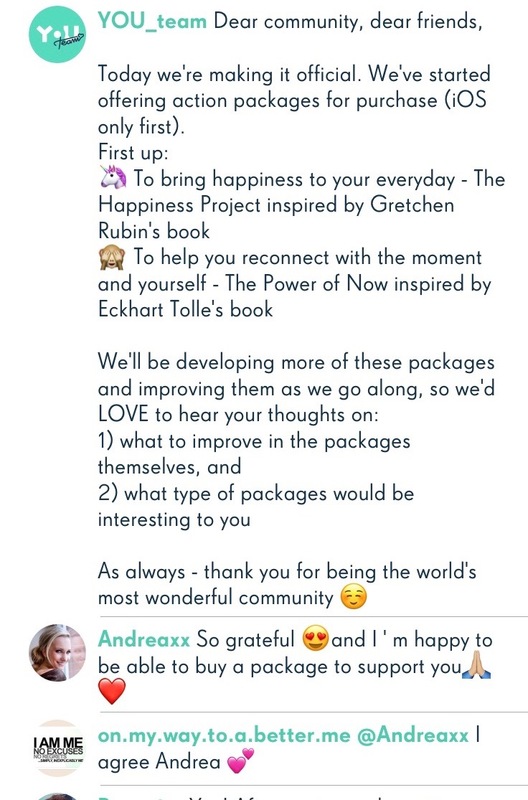 They accomplish small actions in areas like body, food, mind, or love, and share their progress with the community, by posting a picture and a short text. 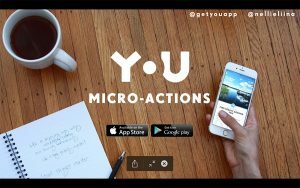 The YOU-App is not at all about winning over others; it’s all about supporting each other, through encouragement and reward of good choices – an approach which makes everybody win. The YOU-Community is my favourite community for two reasons. As a user I really have the feeling of being part of something bigger; I even developed relationships with other users – something I have never experienced in an online environment before. As a researcher I see for the first time all the phenomena I was thinking and writing about, without being able to observe them in the field. It feels like meeting a unicorn for real. YOU-Community members are very active, they interact, share intimate details, build and maintain relationships – and even organise offline meetups all over the world. What the heck makes them do this? I had several hypotheses, which I was lucky enough to discuss with Nelli Lähteenmäki, Co-Founder and CEO of YOU. We met in Winterthur – yes, Nelli came from Helsinki to Winterthur, just to share her experiences and insights with the participants of the further education course CAS Community Communication who tackled Virtual Communities for a whole semester. 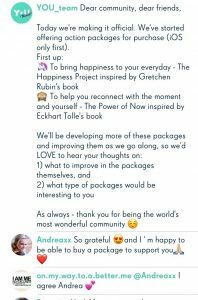 This approachability and spontaneity of a very busy start-up CEO, the willingness to share knowledge for totally altruistic reasons, is very symbolic. The founders created YOU in order to make the world a better place. This is not a strategic mission statement; it’s something I believe after only five minutes of talking with Nelli. The spirit of the founders is the core of the YOU-Community. Hypothesis 1 proved: A functioning community builds on authenticity, on genuine goals and real needs. The YOU-Team is not „managing“ a community; they are part of it. On the one hand, team members accomplish micro actions themselves; on the other hand, they make the ideas and problems behind the app development transparent – they share success, discuss problems and invite community members to express their opinions on the next steps in app-development. For example, when introducing paid content. For the first time in my life, I saw app users expressing their enthusiasm about finally being able to support app operators monetarily. Hypothesis 2 proved: Transparency and honesty lead to commitment. The YOU-Community is very engaged and innovative. The relationships between members overcome geographical and technological boundaries – people send each other postcards, connect with email or whatsapp and even organise meetups. Which took the YOU-Team by surprise. Their reaction: Joy, publicly expressed on the YOU-App of course and immediately the question: How can we facilitate future meetups? What do you guys need? Hypothesis 3 proved: Unicorns have needs. If you let them free, they will express them, find ways to meet them, and at the same time show you how to develop yourself.